Event Description : EXHIBITION : Easel Stories presents "Soulmate" a rare group show of paintings by 20 art maestros. 20 artists, one gallery and a plethora of artworks deriving from the very soul of the artistes. Ms Renu Khera, Director of National Institute of Fine Arts has curated 'Soulmate' a group show illustrating art as the reflection of the soul. 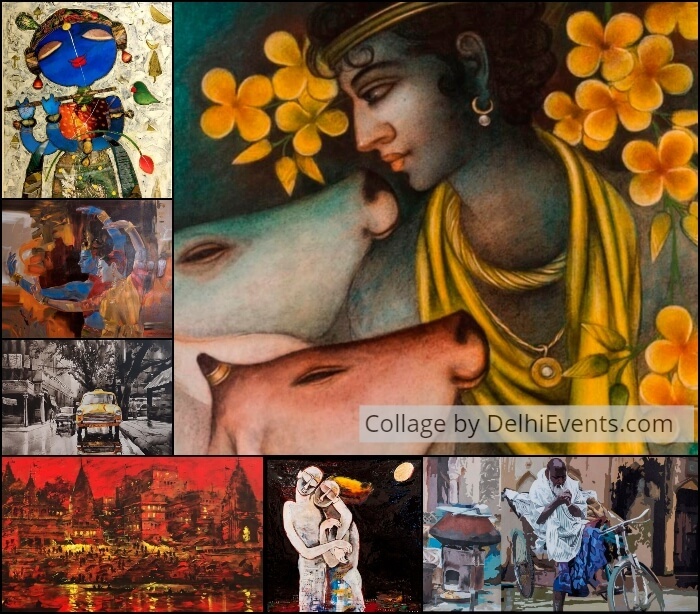 Showcasing a collection of paintings by senior, eminent and contemporary artists, the exhibition puts forth the various facets of Indian mythology, religious thoughts, vintage theme, culture, life and nature. An amalgamation of artworks by over 20 artists of Indian origin from across the world, the exhibition features names like Sujata Bajaj, Niladri Paul Bratin Khan, Arpan Bhowmik, G Subramanian and Sandeep Chhatraband amongst others. With a vision of bringing together art beyond boundaries the exhibit will be on till the 4th of June, 2018 and provide a common ground to artists both eminent and upcoming to illustrate the ever binding nature of art like a soul. The four day show touches upon the thought of art as a Soul mate that is aligned with your soul and is sent to challenge, awaken and stir different parts of you in order for your soul to transcend to a higher level of consciousness and awareness. Art calls for complete mastery of techniques, developed by reflection within the soul. Artists have been practicing various forms of art for years. Their works are very much connected with their thought, emotions and lives. They put their soul on canvas to enhance the beauty of their work and it is this thought process that will entrance the spectators at the exhibition. “Soulmate’ is an exhibition that brings together both masters from the Indian art circuit and promising upcoming artists. The concept touches upon artworks as reflections of an artist's very being deriving and being a part of him like a soulmate. There are 20 different artists with different mediums of work and different thought processes so to see them together under one roof is truly going to be an unforgettable experience for the spectators”, says Renu Khera, curator of the show. Sujata Bajaj one of the artist’s fascination with the lord of beginnings, Ganesh is abiding. Her art explores Ganapati as the endless, painting and sculpting him with a a sense of complete freedom and liberty in abstracting his image. While Bratin Khan the master of traditional and folklore themes brings alive the themes of Indian mythology. Fragile, emotive and rich in colour and details Bratin’s works use the traditional method of tempera painting, which goes back to the Indian Miniatures. Seven to eight coats of transparent color are put on the surface, one after another to get a complete tone. Simple but evocative, Arpan Bhowmik’s art is a study in contrast. His largely monochromatic cityscapes have a splash of colour thrown in every so often, lending his art a surreal effect. Bhowmik’s paintings showcase the vintage theme of a heritage city, Kolkata bringing the city and its humdrum affairs to life with his brushstrokes. Whereas, a painter and a collagist, G. Subramanian uses the medium of collage, and layers it along with acrylic paint and ink washes in brilliant hues to create mixed media works. The inspiration for Subramanian’s works the innocence and divine beauty in a child’s face and the power of Indian mythology. With his portrayal of child-like Buddha, Krishna and Hanuman, he seeks to spark a sense of joy in his audience. Sandeep Chhatraband loves to portray the ghats of Varanasi using water colours and acrylics on canvas. Unique, tranquil and vivid the 'Ghats of Varanasi' are his inspiration. With their ever changing hues, the flow and crowd of people and its many stories the ghats of Varanasi are his ode to the city. Perfect for summer days, the exhibition is food for the soul and brings to light some of the maestros of Indian art.